Poly(glycidyl azide) (PGA) is considered excellent energetic binder or plasticizer in advanced solid propellants because of its high heat of combustion, thermal stability, and good compatibility with oxidizers. 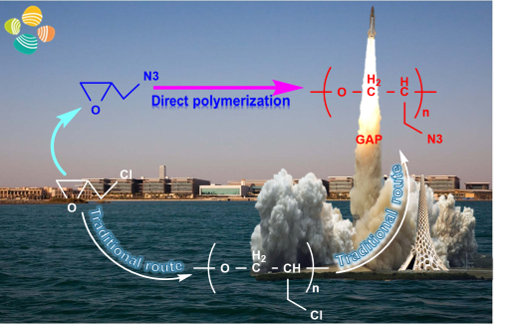 The pendent explosophore azido groups in poly(glycidyl azide) serve to improve the energetics of the binder and boost the overall performance of propellants. However for the applications mentioned above the reported synthetic methods of PGA all resort to an indirect strategy of synthesis involving the post-modification or azidation of poly(epichlorohydrin) to generate poly(glycidyl azide). As a matter of fact, no literature reference could be found indicating how to directly polymerize glycidyl azide and obtain the corresponding polymer, poly(glycidyl azide), without interference by its pendent azido groups. In our recent paper in Nature Communications (https://www.nature.com/articles/s41467-018-08251-1.pdf), we reported that glycidyl azide can be directly homopolymerized under “living conditions” into well-defined poly(glycidyl azide) through anionic ring-opening polymerization using onium salts as initiator in the presence of triethyl borane. In an earlier work (J. Am. Chem. Soc. 2016, 138, 11117-11120), we showed that poly(cyclohexene carbonate) and poly(propylene carbonate) can be obtained through copolymerization of CO2 with the corresponding epoxide monomer -cyclohexene oxide or propylene oxide- with triethyl borane as activator: as the latter Lewis acid is much milder than other Lewis acids which would react and ring-open glycidyl azide, it could be successfully used to activate the latter monomer and bring about its ring opening polymerization. Upon carrying out the polymerization reactions at 0 oC, and using 5 eq. of triethyl borane with respect to the (Oct)4NBr initiator, transfer reactions to the monomer and to the polymer chains could be effectively suppressed; polymerization occurred under these metal-free conditions in a controlled manner, affording poly(glycidyl azide) within a range of molar masses between 1,000 and 11,000 g/mol. 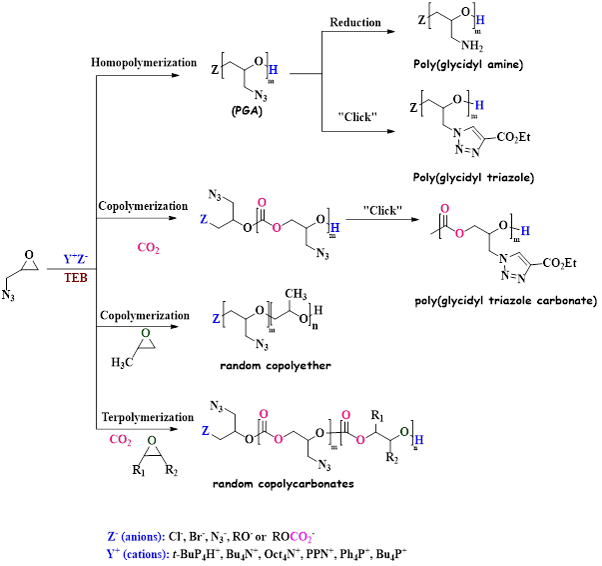 α,ω-dihydroxy poly(glycidyl azide) telechelics of very low polydispersity and carrying all of their azido functions, thus responding to the requirement of propellant binders, could be easily prepared in this way.